A wedding is a ceremony that celebrates the beginning of a marriage. Wedding traditions and customs vary greatly between cultures, ethnic groups, religions, countries and even social classes. A wedding is one of life's major events, an opportunity to celebrate with friends and family. One tradition that has become almost universal is photographing the event, recording forever the magic of a wedding day. Photographs are keepsakes, souvenirs for capturing and reliving memories; allowing us to immortalize and forever freeze in time these peak moments. After all, life is not just longevity or how long you live, but how you live it and the extraordinary moments that make memories unique. Modern day dentistry can help ensure that your wedding day smile will make you look and feel your best, and not just for the pictures, but for your overall health and well being in the years to come. Three decades after the cosmetic dentistry revolution, the American public, and more specifically engaged couples themselves, are demanding more effective smile enhancement solutions for their special day. This has created momentum in a movement for wedding day preparation. The crux of this reform is mostly due to the importance that the public places on first impressions; appearance and beautiful smiles in particular. 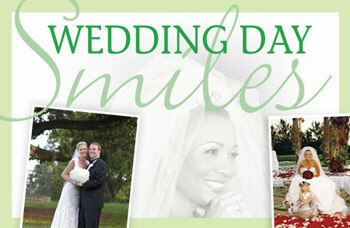 With the many cosmetic dental services available in the 21st century, a wedding day smile may be nearer than you think. Let's examine what really constitutes a great smile. Perhaps the first hint of a smile is in the eyes, but a smile is reflected in your whole face; eyes, clear skin, complexion, and more. The lips are the curtains hiding the smile, and when they part — the true revelation — your teeth become the main show taking center stage. So let's face it — it really is the smile that lights up your face. Without a beautiful smile, first impressions may not be all they could and should be. And when the curtain goes up on an unattractive smile it's noticed immediately. If teeth are discolored, misaligned, misshapen, or missing — it's a show stopper right then and there. Besides, a perfect smile doesn't only include pearly white, straight teeth. You should be concerned about the health and functionality of your teeth, not for just the wedding day, but always. Your dentist is a good place to start to consider the best overall approach to aesthetic enhancement and dental health. Even something quite simple like tooth whitening or tooth bonding can create even a subtle improvement. An ideal full aesthetic makeover or enhancement may require the expertise of a team of dental specialists to create optimal results. The following stories of one bride and one groom will illustrate how modern dentistry helped make each of their wedding days everything they dreamed it should be. In addition, this investment provided better function for ensuring long-term oral health.